Watching shows about Alaska makes me realize how much of a wimp I am. Life looks rougher and a bunch colder there than where I live, but I’m fascinated by some of their tools. 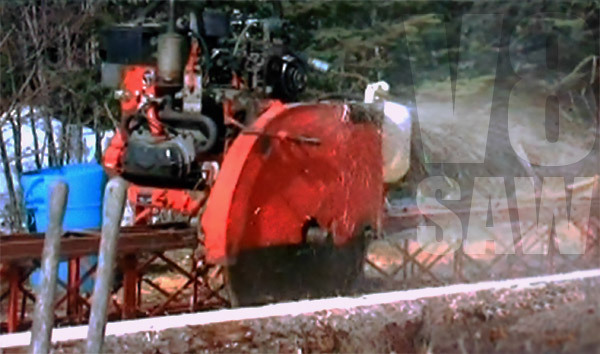 And the custom-built V8 sawmill I saw on Alaska: The Last Frontier was pretty damn sweet. For most of us, wood is store-bought and arrives in pallets or ready-made sheets. For these, folks if you want lumber you cut your own, starting with the tree. Then you roll/transport it to the sawmill and use a badass blade powered by a 4-stroke truck motor on homespun scaffolding to cut it. It’s back breaking labor, a pain to set up, and even harder to run, but you can make it happen. This concept is very appealing to me. The sheer creativity and power of it is alluring. The reality is they have this setup because there’s no other way to get it done and every time they engage in the woodcutting process the entire enterprise is fraught with difficulty and less-than-happy conditions. Our hat is off to the guys who are getting this done. Also, props on the sweet chicken coop they built in this episode. Here’s a little piece of trivia for you. This would be the family of the singer Jewel. I rented the house her dad Atz built in Anchorage. It was massive Swiss style chalet perched on the hillside over-looking the city. with 2 exhaust pipes coming out into a muffler. ya thats a cool show, really enjoy it. And then there are mementos from when loggers walked the earth and millwrights reduced their production to dimensionalized lumber. My Uncle hauled an inline 6 marine diesel up the slough, bedded it into a couple baulks of timber and slowly created first the head saw and carriage mechanism and then power transmission systems to run trim and cutoff saws and the green chain. It has operated for six decades milling lumber out of the remains left from timber harvesting around the Coos Bay slough system. You got to learn a lot about peavys, cant hooks and walking floating logs to punt them out of ponds and slough backwaters. In timber country, you had one of these homebuilt sawmills wherever there was an inventive logger mechanic. Growing up on a small cow-and-a-half dairy, we had rough lumber available by the truckload, and nobody thought anything about going to a lumber yard once the planer mill got built on. I couldn’t imagine a simpler or more robust workhorse of motor for something like this than the [much lamented] VW aircooled 4 banger. Don’t people normally use bandsaws for this? Resawing wood with circular saws can be a bit freaky.